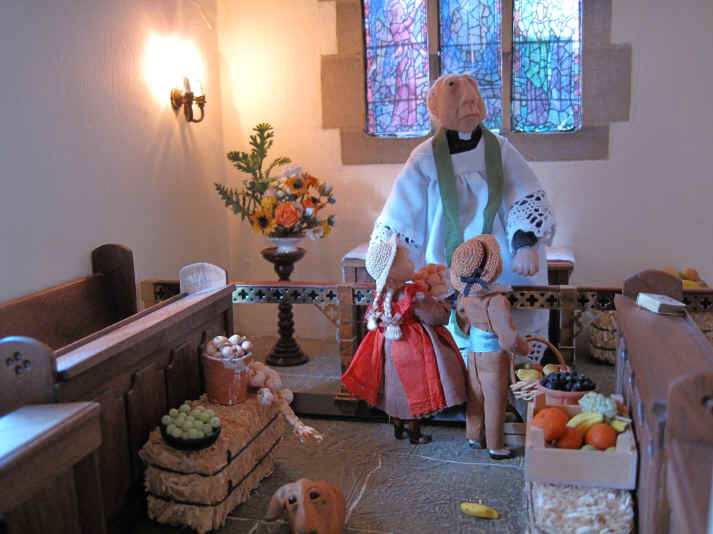 The preparations for St. Hilary's Harvest Festival don't go quite to plan this year! Find out why below! Esther and Adele are at church to help prepare it for the annual Harvest Festival Service. 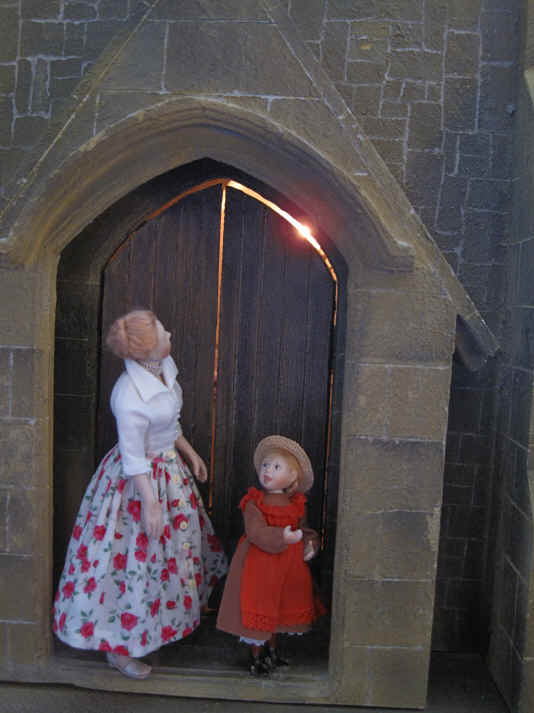 Oh dear...........Esther hears some funny noise at the top of the church bell tower and has come out to have a look.........Adele is curious and follows her! 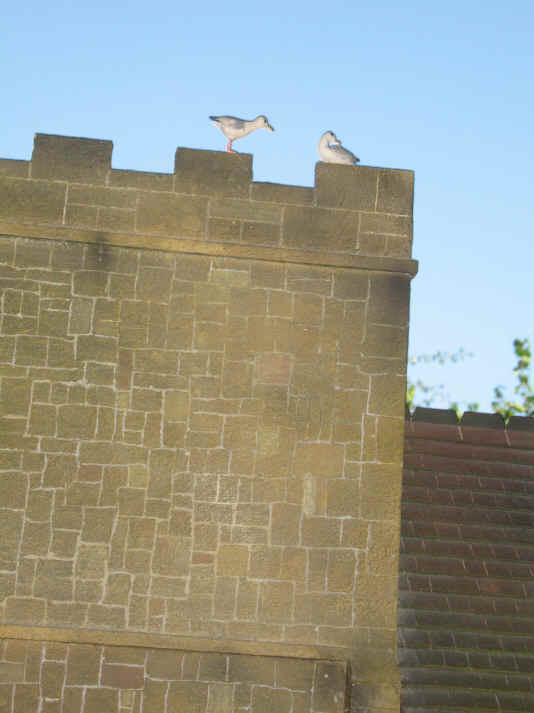 Two seagulls have arrived and are having a great time on top of the bell tower of the church calling to each other! 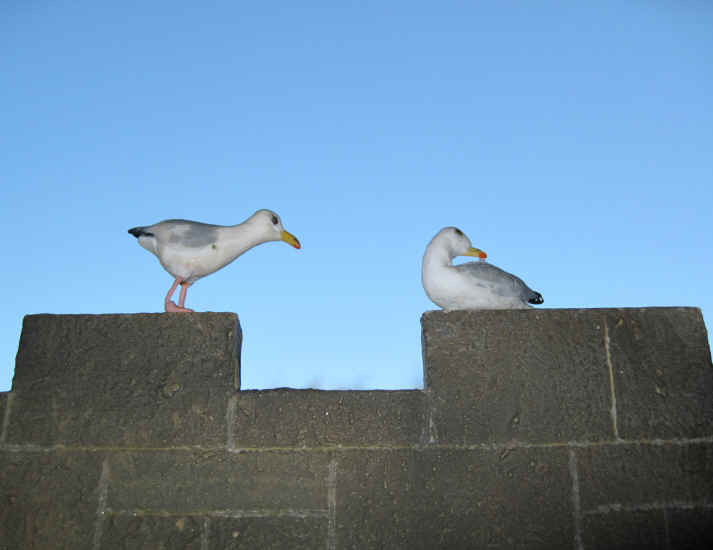 The gulls are calling loudly to their friends to tell them some exciting news........we wonder WHAT it is? Adele has already followed some more gull calling she could hear from behind the back of the church. SOMEBODY has been helping tidy up the church and putting the rubbish into the church bin! However......they forgot to do something VERY important.........put the lid back on! The seagulls are very clever and they could smell the remains of Homer's last meal of fish and chips in paper from a long way away and found that it had fallen on the floor. They are really enjoying their impromptu meal of half finished fish and chips Homer never finished! Magnfi-Cat is NOT at all interested in Alice.....HE is keeping an eye on the church mice Nunc Dimittis and Snowy. 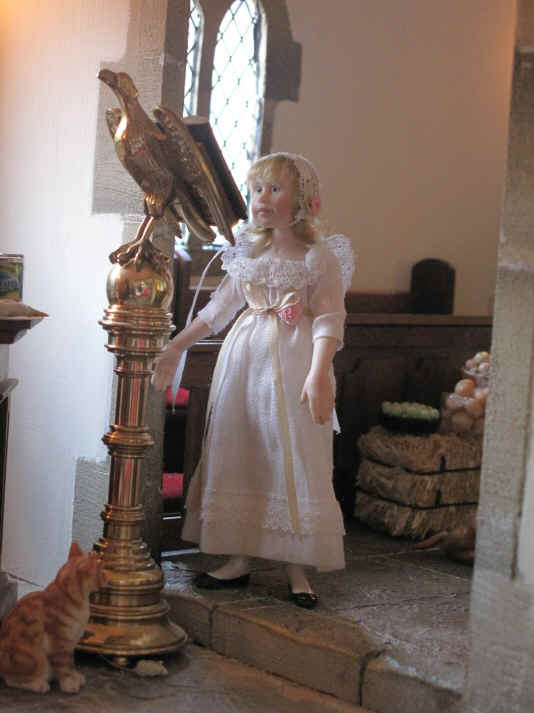 However it will not be a surprise if the mice run under the eagle lectern to avoid Magnifi-Cat.............usually just in time! Better luck next time Magnifi-Cat! 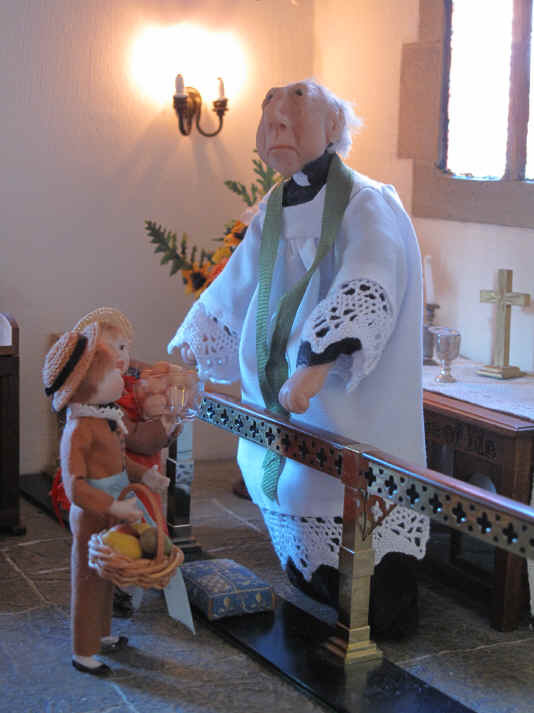 The vicar has asked Ambrose and some of the children to bring something each to church to illustrate his sermon. You can see that Ambrose has brought a fish...............and who else has brought a fish? It is Priscilla Jane! Adele has brought a loaf of bread along. 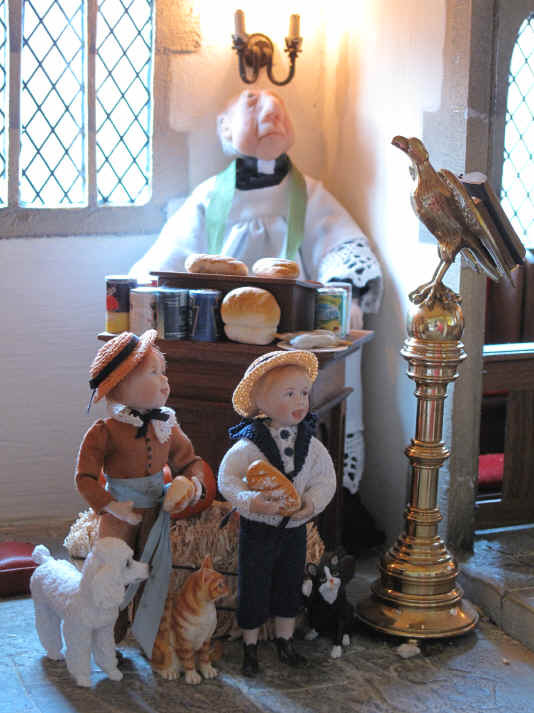 Can you see the vicar has already brought two loaves himself? Poor Tinker - she SO fancies eating that fish Priscilla Jane is holding! Ben and Tom have also brought a loaf of bread each! Oh dear.....Magnifi-Cat and Belle are intent on having a look at the loaves too. Tinker is not content to look.....she is trying to reach Tom's loaf! 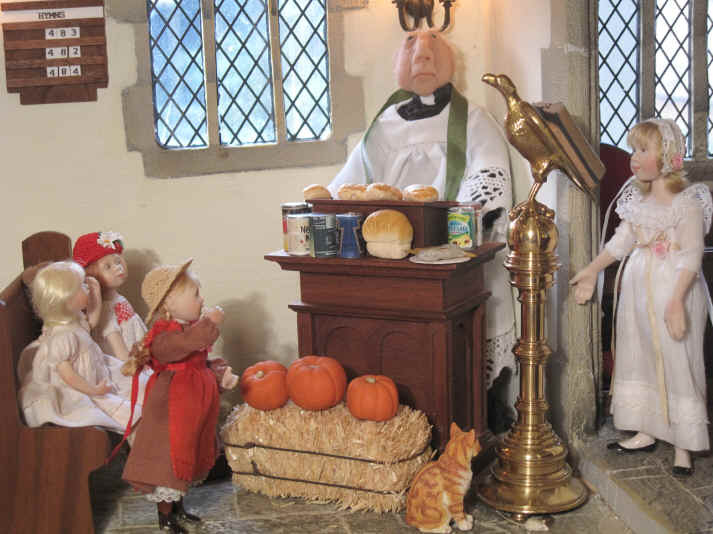 The vicar asks the children how many loaves there are..........................and then......how many fishes! Before the children answer........can YOU count them?! Magnfi-Cat is certainly trying but he can only count the three big pumpkins that Ambrose grew on his farm as he is not tall enough to see all the loaves of bread! Adele and Phoebe are the first to have their hands up! Phoebe is quick to tell the vicar that there are five loaves and two fishes! The vicar admits that he doesn't think he could because he was NOT Jesus! He goes on to explain that the "Feeding of the Five Thousand" tells us how bountiful God is to ALL of us and it is good to remember this particularly today as we celebrate Harvest. He reminds them that they must look after God's world. Adele then tells him about Homer forgetting to put the lid on the bin so that his half eaten fish and chips were found by some wandering sea gulls! Oh dear......lets hope she hasn't got Homer into trouble here! Adele is bringing her bowl of eggs up to the sanctuary for the vicar to bless them. Ben has brought a basket of fruit to be blessed too! 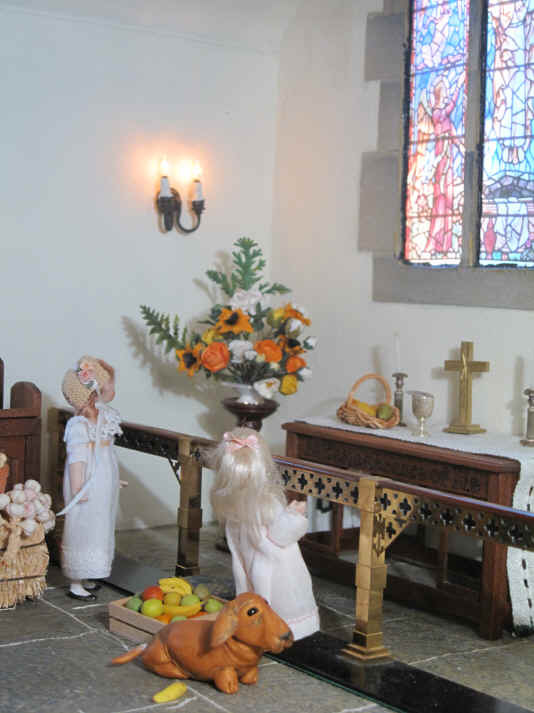 The vicar takes both the bowl of eggs and basket of fruit from Adele and Ben. This is a symbolic act by which the vicar, by blessing the food, is acknowledging that everything that we have all comes from God. 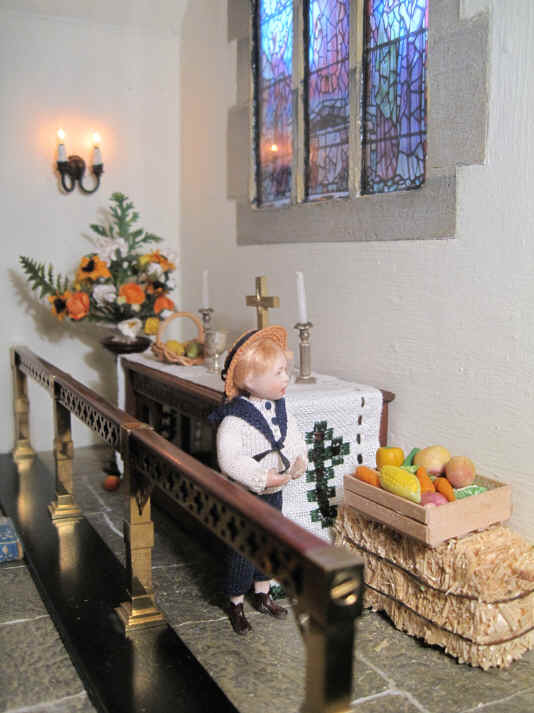 Tom is admiring the vegetables on the bale of hay next to the altar. You can see that the cross on the altar cloth is green. Green is always used during the church season of Trinity. Megan always enjoys admiring the flower arrangements in the sanctuary as she is here! Priscilla Jane is taking a short time out to offer a prayer of thanks to God for all of HIS goodness to her and everyone at St. Hilary's! 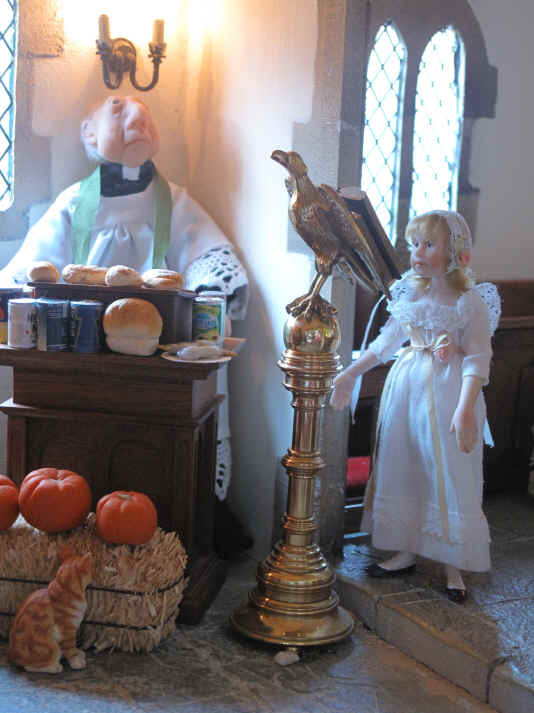 Bardsley too is enjoying Harvest Festival............umm.........or is he really hoping that someone will offer him something nice to eat? 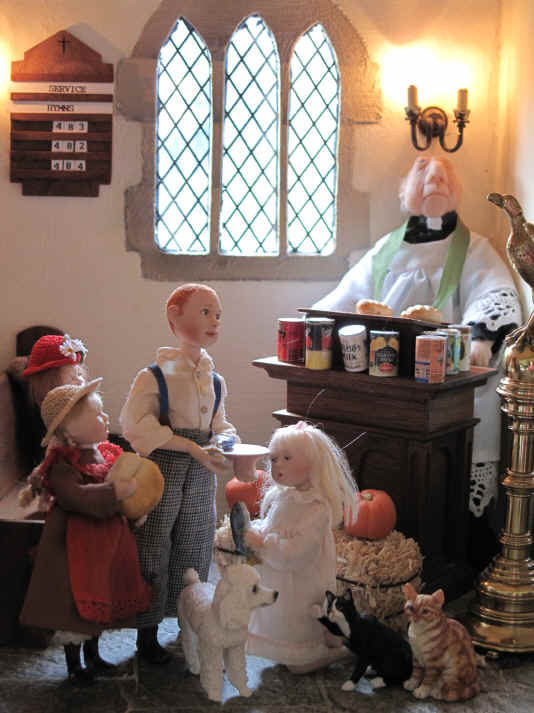 However the vicar has already arranged for all of the harvest food to be distributed amongst those in the parish who would very much appreciate it. All of the fruit, vegetables, eggs (complete with real feathers courtesy of one pet budgie! 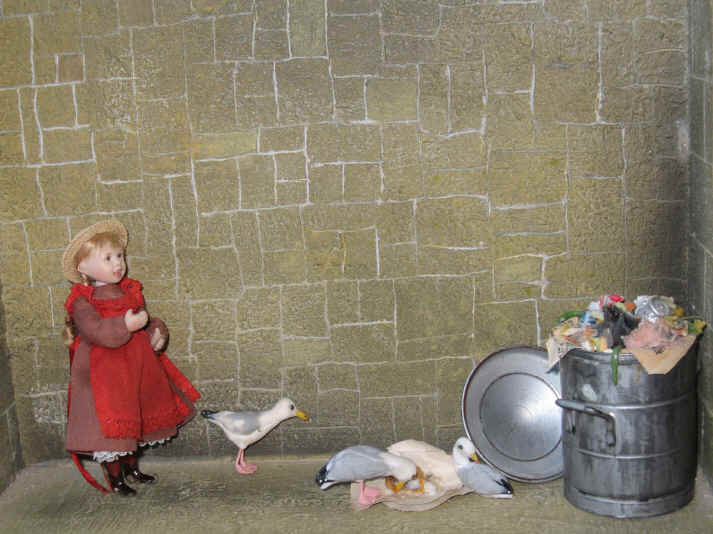 ), bin and even the three seagulls have been provided by Catherine Davies, sister of myself, Sarah Price, of www.dollshouseheaven.co.uk.